You are currently browsing the tag archive for the ‘Bahaullah’ tag. “With shattered hearts, we have received news of the destruction of the Most Great House— the House of Bahá’u’lláh in Baghdad. While the precise circumstances attending this outrageous violation are as yet unclear, its immediate consequence is without doubt, and must be emphatically stated: The peoples of the world have been robbed of a sanctuary of incalculable sacredness. It was in the courtyard of this House that the Shia Kurds, who came to cause trouble, were invited in by Bahá’u’lláh (read the story here). It was also outside this House that the large number of residents of Baghdad had gathered or rather rushed forward from all directions, both friends and strangers, lamenting, crying and grief-stricken, as Bahá’u’lláh was leaving this House as He had, once again been banished. The picture below shows the floor plan of the second floor of the House. Floor plan of House of Bahaullah in Baghdad. The blue dot with the dashed lines, show (as the best of my knowledge) where spot from which the picture below is taken. In the picture below, you will see numbers 1, 2 and 3. These correspond to the numbers in the floor plan. Number 1 is where the staircase to the upper floor is. Number 2 is the hallway leading to the room of `Abdu’l-Bahá and number 3 is the bannister in front of the room in which the Blessed Beauty occupied. 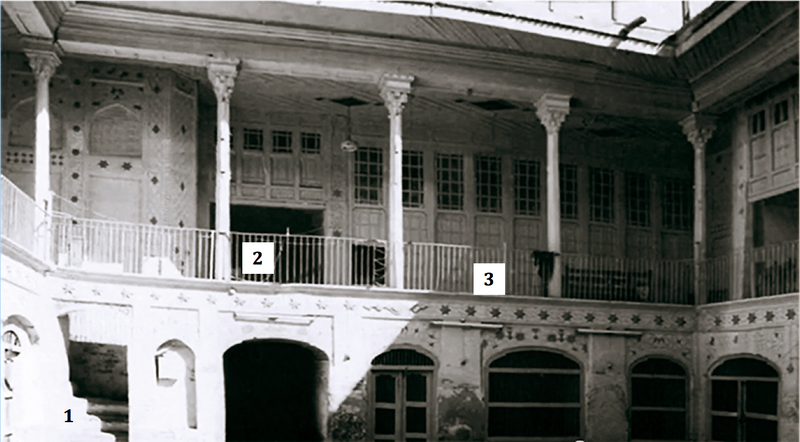 House of Bahaullah in Baghdad (after restoration in 1930-ties). 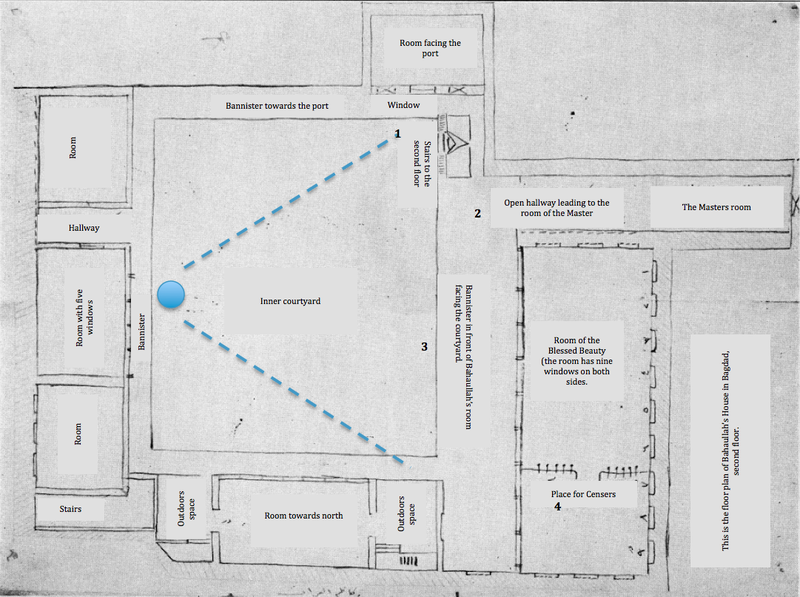 The picture is taken from the inner courtyard (where the blue dot is placed on the floor plan). Number 4 on the image depicting the floor plan of the House, is where they most likely stored their censers. Censer is a type of vessel that is commonly used to burn incents but they vary greatly in size, shape, design and are used for various purposes. It is likely that the censers in the House of Bahá’u’lláh were used for heating or for boiling or keeping boiled water (for tea) hot. Unfortunately, I don’t know much more about what kind and type was used in this House. On the 29th of May, the Bahais commemorates the Ascension of Bahá’u’lláh. Oftentimes, as part of the commemoration, programs are made with extracts from the Writings. Here you can find both a program and a slideshow for commemorating this Holy Day. The program begins with the story of Bahá’u’lláh indicating weeks before His Ascension that it was soon time. Then the focus shifts to the sufferings of Bahá’u’lláh, His Majestic Figure, His Ascension and finally, His last wish for us and mankind. The slideshow follows the same pattern. Hopefully, these will contribute for a more spiritual commemoration. The Blessed Beauty was a source of great bounty and mercy for all, but particularly for the poor to whom He gave special attention. Always He bestowed gifts upon the disabled, the orphans and the needy whom He met during His walks in the city. One of these was a woman of eighty who lived in a deprived area through which Bahá’u’lláh often passed. Each day, as He walked from His house towards the coffee-house of Sar-i-jisr, she would wait for him in the roadway. Bahá’u’lláh was exceedingly kind to her and always asked after her health. Although He would not let her kiss His hands, whenever she wanted to kiss His cheeks, because she was bent with age and short of stature, He would bend down so that she could realize her wish. Often He remarked, ‘Because I love this old woman so much, she also loves Me.’ Throughout His time in Baghdad, He showered her with kindness, and before leaving for Constantinople, He arranged an allowance for her to the end of her days.